Make sure to read my review of Jamie Emerson's excellent new guidebook to alpine bouldering in Colorado. I recently had the opportunity to sit down with Daniel Woods before his departure for the World Cup circuit in Europe including stops at Eindhoven, Barcelona and Sheffield. This interview was a follow-up to a post I wrote called The Morning After the World Cup at Vail where, in contrast to previous years, no American male climbers made it into finals. I wanted to talk with Daniel about what was going on and what some of the differences were between the European and American approaches to competition climbing. I also wanted to hear his thoughts on the future of bouldering and sport climbing and his own plans for the near future. We talked for nearly an hour on all aspects of the comp, bouldering and sport scenes and Daniel's energy and enthusiasm for climbing was on full display. It was a very informative interview though the crowd at Whole Foods didn't seem to be paying much attention. Just another day in Boulder, I suppose. Initially I wanted to focus on the issues American competitors face in competing in Europe and what needs to change in order to level the playing field a bit. But we ranged far and wide in discussing the current climbing world, the professionalization of climbing, sponsorship, and much more. I want to thank Daniel right off for the generous offer of time and his candor on some of these questions. Especially given the pressure of heading off to Europe in only a few days, he was a true professional in meeting up and talking with me. We were talking about the differences between European support, team staff and organization versus the American system. Tell me more about this. I think basically the main difference that I see between European and American climbers is the training and resources that Europeans have compared to US climbers. In Europe the federation supports the climbers. They provide a coach, a physio, they have team meetings where they’ll get together a month prior to the competition and they will train their athletes to get them in their top form whereas in the US, we have a team coach but we don’t have specific dates that we all meet up as a US team and train for three weeks and part of it is that we just don’t have the support from the US federation like the other countries do. I would like to see, it would be cool to have a good three weeks before the World Cup circuit starts where we all group together in either Boulder or some town or city where there are many gyms available where we can have our head routesetters come in and set us circuit problems that we will be seeing in the world cup events. So we at least have the experience so we don’t get out there and underperform when we are trying to climb. You mentioned meeting prior to the events for a few weeks. What about the rest of the year? Are there year-round differences? I think Europeans have an offseason as well. So they will train very hard for the World Cups and then they will go into their off season where they will go outside climbing. But they still have taken in what they have learned in that month before the competition, they’ll take in that information and they will continue to pursue it, maybe not as heavily as before a comp, to keep themselves conditioned. I think that’s all the US needs, we just need a plan so we can all group together and learn how to climb on volumes, how to climb technically, how to mentally prepare for competitions and we can take that information on our own time and apply it. The problem is we are all running around like chickens with our heads cut off and we’re lost; we don’t really know how to prepare. Our view of a training session is going into the gym climbing for two hours, going home and eating fast food, going to sleep and repeating whereas if we had a specific program to follow, which would usually be around a six hour per day program with a couple rest days in between, and then a diet program, have physios to help recovery, we can have that for a month and for our offseason we can still apply it, just not as strictly as before. You mentioned the different styles of climbing, including volumes and technical problems. Can you comment more on how the World Cup style differs from what we might be used to in typical US route setting, even in big gyms such as here in Boulder? I think the main difference in World Cup climbing is that it’s not comfortable climbing where US setting tends to be comfortable climbing. You’ll take a very basic pinch and you will jump to another basic pinch or you’ll maybe do a not so extreme rose move off a jug foot, very straightforward, easy-to-read climbing whereas in the World Cup they know most men and women are very strong, they are some of the best athletes in the world. Most men typically can jump from point A to point B easily and stick the move. In World Cups they create volumes, they create crimps, and they’ll put a screw-on right next to the crimp so you will have to grab the edge as a two-finger spike and match it or you will have to do very dicey finish move where you will have to take both pointer fingers and very technically match the finishing hold and then drop off. They know that if you just dyno to the end jug, all their competitors can do that. They try to set non-comfortable climbing and they try to set it like outdoor climbing where you have to move statically between each hold and really use your heels, really use your toes. In the US, all we know how to do is jump so when we see a volume, we’re lost. You seem to be saying the US style tends to be very point to point while the European style forces you to puzzle out a large volume or feature of some kind. You were talking about the ways in which European routesetters are able to give their national team insight into the nature of World Cup routesetting. Maybe you could enlarge on that some more? In Europe, there are two main head routesetters that are internationally certified; Jacky Godoffe and Tonde Katiyo, and they are both from France and I know that the French team receives problems set by Jacky all year round. Tonde travels all over Europe and sets at each major gym to give people an idea of what to expect at a World Cup event. In the US our setters set commercially, they don’t set for World Cups. If you have all the European teams able to have this World Cup practice and the US team is basically lost, it doesn’t seem quite right in my opinion. It seems we need a US internationally certified setter to tour around the gyms and set World Cup style problems, someone like Chris Danielson. Is there really a gym that has the kind of infrastructure or actual structures that can support World Cup style routesetting? That’s another problem. Most of our gyms in the US are not similar. The angles vary too much. In The Spot, for example, you have a steep section but it’s very wavy in some points. You need gyms that are like World Cup walls. Many European gyms are laid out like that, basic plywood walls where they throw up millions of holds and they do angle changes by putting volumes on the wall. That’s why they are so talented at climbing on volumes. You can walk into The Spot and see maybe two volumes covered with holds so the volume does nothing by itself. Are there other competitors besides yourself from the US who have similar depth of experience with the way things are done in Europe? The two competitors I can think of at the moment are Alex Johnson and Alex Puccio. This is Alex’s Johnson’s second year and Alex Puccio’s first year on the circuit. Those are the only two female athletes I can think of that know how Europeans set. On the male side, most males haven’t gone over to Europe beside Chris Sharma back in the day and Ethan Pringle’s done a couple of World Cups here and there. The funding is a big part of this because Europeans have full support when they do the World Cups. They have accommodations, travel, transportation, all paid for by the federation. That’s a major reason that a lot of US athletes haven’t had the chance to go Europe. Will the European style of setting remain standard? I think it will for sure because to the eye, to the audience, it’s appealing to see a wall littered with volumes because it looks impossible. How is the climber going to arrive at the top? It also gives you a much more creative side to setting. In the US you go to every competition and they’ll try to set technical but it’s still pretty much straightforward power problems. In the US mind, technical means climbing foot first or doing a 360 in a roof or climbing a straightforward balancy slab. In Europe, they know they can make it technical by throwing four volumes on the wall, putting grip-tape on the volumes and the climber can figure out how to get to the top. I don’t think that will change. European setting will stay the same and I feel like US setting will change later on as they see how Europeans do it. They may use both styles in setting problems. What sort of recommendations do you have for a young boulderer who wants to make a mark on the World Cup circuit? If you’re starting out young and you’re motivated… what really helped me out was being obsessive about watching World Cup videos online. Usually before the World Cups I will watch videos over and over just to see how climbers move and how they grab onto volumes so when I go (since I can’t practice it here) I can see how climbers maneuver in that kind of terrain so I’m not lost. It’s good to enter in every competition possible to gain that experience because in your first few competitions, or your first two years of competing, you’re probably going to fail. It’s how the game works so you have to take that failure and try to fix it and gain success later down the road. What are your plans for the future in bouldering and sport climbing? I am going to finish out this year in Europe bouldering in Ticino, working on Story of Two Worlds, and going to Varazze to try Gioia, climbs like this, and a couple of projects I would like to complete but in spring I am going to switch over and get into roped mode. I have been obsessing over sport climbing for the past two years and definitely miss it. Do you think there will be other boulderers switching over to roped climbing? That’s hard to say because one of the reasons I am switching to sport climbing is because I am kind of getting bored with bouldering. I want to do something new. I want to climb 9a, 9a+, 9b. While there are some climbers who are just in live with bouldering, I would like to see more climbers get on a rope and push the standards because there is a good strength level in bouldering and all you need is endurance and some mental control to get up some of the hardest sport climbs in the world. 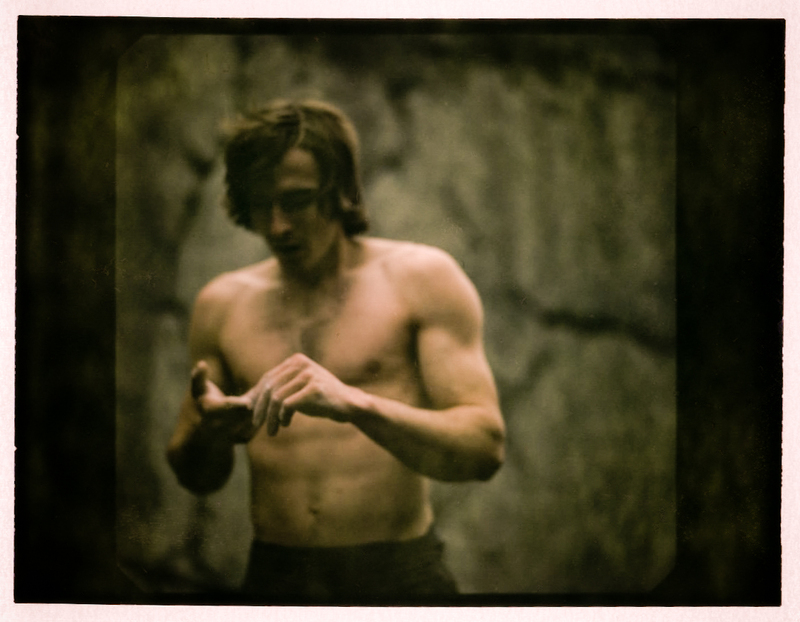 What do you think about Adam Ondra? Ondra, he’s a freak, he’s the next level. You look at Ondra, he has a love for rock climbing, whether it’s bouldering, competition, big wall climbing or sport climbing. He wants to do everything. Adam Ondra is one of my biggest inspirations in climbing because I look at this and want to be able to do everything, to be versatile in what I do as well. The next step is to improve my sport climbing skills. Where’s the future in hard bouldering and sport climbing? I think the future in bouldering is hard to tell. It will probably be in power-resistance boulder problems, connecting two V14s or V15s to reach the next level. It’s going to be very hard to find something that is just one or two pure hard power moves to create something that is V16. Sport climbing has so much potential. We’ll see multiple V13s put together on a rope and Adam Ondra will be the guy to do that and I think some boulderers like Paul Robinson will want to try that as well. Dave’s been raving about that project and that’s the perfect example. That climb will probably be around 15 to 20 moves long where you will be connecting a V14 into a V15 which is pretty heinous and could be V16 easily. It’s funny because when I am looking on Internet forums and people say that problem is too long to be considered a boulder problem. Honestly the difference between bouldering and sport climbing is that in sport climbing you have bolts and you are tied in. That’s the only difference. In bouldering you are climbing ropeless. In bouldering there are two different forms. There is resistance bouldering and power bouldering. Climbing is progressing in a way that we will have to have two different sports even within bouldering, power and resistance, and both are very cool. Exactly. In Europe traverses are very popular whereas in America boulderers look at traverses and think they’re a waste of time (laughing). What are your sport climbing goals in Europe? So far I want to try Chris Sharma’s 9b Golpe de Estado, La Cappella, a bouldery 15 meter 9b just put up by Adam Ondra, Chaxi Raxi looks amazing. Spain is what I am psyched on but also classics like Action Direct and Realization. I mean I have been wanting to do Action Direct ever since I was 13 but never had the chance. Every climb in Europe I am psyched on! The Climbing Narc said it well" For the first time in the 4 years the TMG has hosted this World Cup no Americans stood atop the podium at the end of the comp with Alex Puccio (2nd) and Angie Payne (6th) being the only Americans to even make it to finals." While I do not believe that bouldering competitions are the only measure of climbing ability, it is striking particularly on the male side, how completely the US men were shut out of the finals. No doubt the competitors will have their own thoughts on the subject and in particular I look forward to seeing what Carlo Traversi will have to say. But I would suggest that the time may have come for a second look at how climbers train and prepare for these events. A similar problem is also apparent in looking at the 8a.nu rankings for roped climbing. Not a single American male climber shows up in the top 20. While I know this is a perennial topic for blogging and message boards, I think there is some cause for concern given the push for professionalization among climbers in recent years. Are climbers able to get the coaching, training and travel opportunities that are available to their European counterparts? And perhaps increasingly more important a question is, are they required to train at a world-class level to maintain sponsorships or team memberships? An interesting counterpart to this question is an essay by a British climber and coach, Mark Pretty, on "The Forgotten Art of Training." In the piece which should be required reading for every serious climber, Pretty notes that in contrast to a previous generation that displayed a genuine "thoroughness of their training in whatever form it took and the dedication and energy they applied to it in the pursuit of their goal," today, "in my job as a coach, I see at many walls climbers frittering away their talent and energy in pointless training or idle posing-the ‘big fish in a small pond’ syndrome." He continues "There is a lot of talk but very little walk as most people seem to prefer to mess about on a bouldering wall and call it a training session rather than knuckle down and train." Last year I climbed a bit with a Dutch climber who came to Colorado for the World Cup and was struck by the serious training regimen that he described for the Dutch team. Regular practices, required attendance at competitions and so on. My impression of the Austrian team and others, though only second-hand, is that the same principles apply. The American approach is much more casual and ad hoc and I wonder if the results of this attitude are now starting to show in earnest. Sure there are strong US outdoor climbers though not many on roped climbs and I have no doubt that in outdoor bouldering, US climbers can hold their own. But the results at Vail show some trends that do not look good for US climbers, especially males. What if anything will be done about it is anybody's guess.